Tilapia has a lot to recommend it: it’s cheap, grows fast, can be sustainably farmed, and is low in mercury. Probably the only thing not to love about tilapia is its flavor. Not that it’s actively offensive, just that even in terms of white-fleshed fish tilapia is pretty bland. That blandness can be remedied with ingredients with serious flavor: fish sauce, ginger, chiles, lime juice and herbs. All these are found in larb, the Laotian meat salad that also happens to be the perfect antidote to a long and dreary winter. My recipe, from Cooking from the Heart: The Hmong Kitchen in America by Sami Scripter and Sheng Yang, lists a number of herbs you can choose from: mint, cilantro, Vietnamese coriander, culantro, rice paddy herb, Thai basil, Chinese boxthorn. Tragically our co-op doesn’t carry most of those, so I limited my larb to mint, cilantro, and Thai basil — in spite of the authors’ insistence that authentic larb must contain culantro — but it was still delicious. The word larb for me is associated with raw meat, particularly raw beef. That’s not necessarily the case — larb can be made with cooked or raw meat — but if the idea of raw beef gives you pause, making the salad with raw fish might be a little easier. Just think of it as a south-Asian ceviche. Chop the tilapia into fine pieces. Toss with lime juice and leave to sit until fish turns opaque. Squeeze off excess lime juice and place tilapia in a large bowl. Add the rest of the ingredients to the bowl and toss. 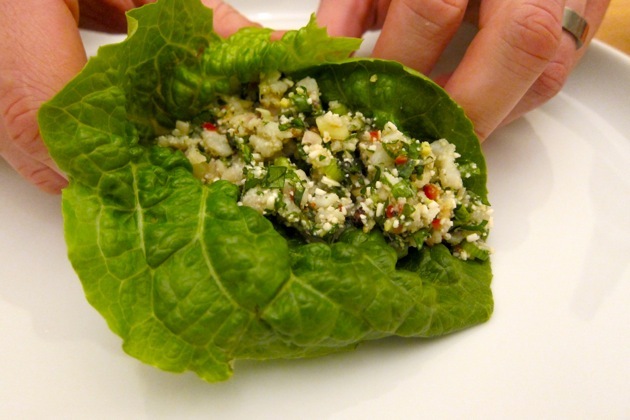 Serve with lettuce leaves for scooping. A note on toasted rice flour: I made this by toasting some rice in a skillet until it was tan and then grinding it in my spice grinder. Unfortunately, I didn’t grind it fine enough, and the rice left unsettling crunchy granules throughout the salad. If you’re going to include it, make sure you grind the rice fully to the consistency of flour. You could also leave it out — the salad wouldn’t be authentic, but I think it would taste fine. This entry was posted by Tom on Thursday, March 3rd, 2011 at 7:25 am and is filed under Recipes. You can subscribe to responses to this entry via RSS. 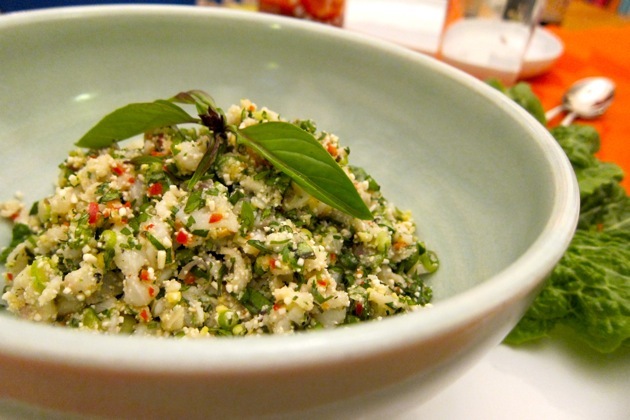 Larb is a great thing to do with tilapia. Often fish larb is called “goy” in Lao–the difference is (so I’m told) the size of the pieces (chunks of fish v. mince for beef larb). It is most commonly made with more meaty fish here, and cut to include the fatty skin but, you work with what you’ve got! Something that also works but it def not traditional-tuna larb, with canned tuna. It makes a great hot weather salad and the herb are all very fresh and crunchy as they haven’t been mixed with warm meat and juices. On rice powder, generally here after toasting we put it in the food processor or blender mill attachment. On a recent trip to the US my husband (Lao) was very disappointed that the only rice power available was too powdery/flour consistency. Here usually its more like sand and the crunch is desired. But I’ve seen it vary regionally in Laos. Kelley — really interesting about the rice powder! My exposure to larb is really limited so I can’t claim to know what is authentic. Martha and I found the crunchiness of the rice distracting, but maybe our expectations were just off. The canned tuna larb variation is a great idea — a nice change from tuna salad! Thanks for sharing this recipe! I made this last night and it was a great light, refreshing meal. I’m always looking for new ways to enjoy tilapia. I fried up some corn tortillas to eat on the side. Yum! !